The astrological chart Natal Hexagram is one of my major interests in the study of the mysteries is the investigation of parallels between various disciplines. Whether these parallels are the result of independent orgin or by communication between the different cultures in most cases is a gray area that cannot be precisely pinpointed. This is very prominent between Eastern and Western cultures. Many investigators claim these parallels to be independent or ‘synchronistic’ while others claim these parallels are due to the great “Silk Route” between the East and the West. Then there are those like myself who are contemporary in their research who compare the context of these parallels while excluding the gray areas of historical orgin for the purpose of eventually defining a singular holistic system. This essay is one step in the process. Because of the obvious parallels that exist between almost all ancient philosophies, I propose there exists a corresponding relationship between the Eastern I Ching and western Astrology and in this essay I present my arguments beginning with the most universal of all integers, the number three (3). In almost every philosophy the number three is one of the most honored of all numbers because it is representative of the number of change. This triad of change or procreation is more often, but not always, referred to as a type of interaction of the male and female which produces an offspring. One of the more familar triads is that of the alchemists’ Sulphur, Salt, and Mercury. In this triad, Sulphur is a soul and secondly an emanation (male), Mercury a Spirit and a modifier of the emanation (female) and Salt a body which fashions the result of the modified emanation. Triads are also prominent in the I Ching. The most obvious is the three realms of Heaven, Earth and Man. It occurs twice in this work. In the hexagram, the fifth and sixth lines are the realm Heaven, the middle two lines the realm of Man, and the bottom two lines the realm of Earth. In the trigram, Heaven is the top line, Earth the bottom line, and Man the middle line. The Sepher Yezirah of the Kabbalah refers to the triad Fire, Breath, and Water. Where Fire is spoken of as male, Water is female and breath decides between them. There is a major and minor triad in a person’s astrological natal chart. The primary triad is the Sun, Moon, and Ascending sign. In western Astrology this triad in itself presents a primary representation of the person as a whole – body, soul, and mind. These three qualities of the person are altered in lesser degrees by planets positions, their aspects to one another and their positions in the twelve houses. A lesser notation is found in the cardinal, fixed and mutable definitions. The signs, elements and houses fall under this classification. The elemental signs are the more prominent qualities in this secondary classification. Each one of the four elements is classified as either cardinal, fixed or mutable. There is a cardinal Fire, mutable Fire and a fixed Fire. There is also a cardinal, fixed and mutable sign for each of the other three elements. These triads from various disciplines, the alchemist’s Sulphur, Salt, and Spirit; the I Ching’s Heaven, Man, and Earth; Astrology’s Sun, Moon, and Ascending signs; the Kabbalah’s Fire, Breath, and Water; are all in essence parallel relationships within each system. The table above shows the triadic parallels for Alchemy, I Ching, the Kabbalah, and Astrology. From this table you can see a quality in one philosophy and its corresponding quality in a different philosophy. When these qualities are interchanged between the disciplines, we end up with some very interesting results. To see how this is accomplished, let us interchange relationships between Astrology and the I Ching and produce an astrological chart called Natal Hexagram. The I Ching triad is the three realms of Heaven, Earth, and Man. The astrological triad is the Sun, Moon and Ascendant. We interchange by letting Heaven correspond to the Sun sign, Earth to the Moon sign and Man to the Ascending sign. Using the symbolic diagrams developed in my article on the Alchemist’s Aether, we can show the following relationship. The I Ching hexagram contains one of the four emblematic symbols, Hsaing, placed in the three positions of Heaven, Earth and Man. The four emblematic symbols were shown in the article on Symbolics to correspond to the Four Elements of the Alchemists, therefore, the astrological chart natal hexagram is formed in the same manner except the elemental sign of the Sun, Moon, and Ascendant is used. These symbols are shown below. When we form the astrological chart natal hexagram we take the elemental sign the Sun resides in and place its symbolic diagram into the top (Heaven) position – lines five and six in the I Ching hexagram. If you are a Cancer by birth then Cancer’s elemental sign Water is placed in this position. The middle position, lines three and four, contains the elemental sign of the Ascendant or Rising sign. The ascending sign of western astrology parallels the I Ching realm of Man. If your Ascending sign is Scorpio then Scorpio’s elemental sign, Water, would go in the middle position. The bottom position contains the elemental sign of the Moon’s position in the natal chart. If you have a Moon in Aquarius then the bottom position would hold the elemental diagram of an Air sign. This completes the formation of the astrological birth chart or the natal hexagram. The next step is to transpose it to an I Ching hexagram. This hexagram is number seven, Sze, whose meaning given in the I Ching is the The Army. The upper trigram is khwan, the receptive, passive, the docile. 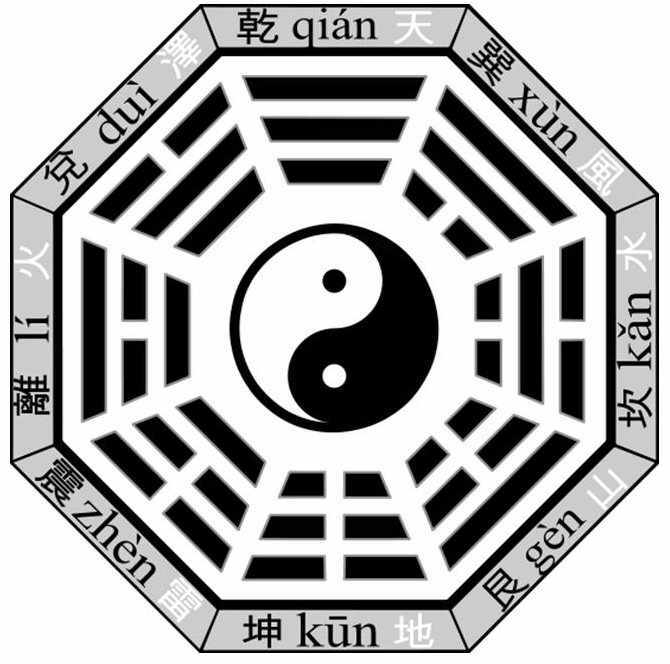 The lower trigram is k’han, peril, difficulty, water, dangerous. The astrological chart natal hexagram is interpreted primarily by the two trigrams. In any hexagram, the upper trigram is one’s outer nature. A person with khwan in the upper trigram is reserved and has an easy-going, kind, passive nature. He/she is also maternal, flexible, patient and calm. The lower trigram is a person’s inner nature and this trigram is occupied by k’han, peril, difficulty, dangerous, which indicates that more often this person will act or speak before he thinks thus getting himself in embarrassing situations (peril). He/she also is the type that will have to do things two or three times before getting it right (difficulty). This person is very clever and cunning but is aimless and without direction, thus the main meaning of the hexagram as a whole (one who needs discipline). Once your astrological chart, the natal hexagram is formed you can consult your favorite I Ching book for further delineations. In the interpretations, first, do your interpretations by the two trigrams formed and then, secondly, by the hex as a whole. Most people familar with the I Ching have developed their own methods of interpretation for each hexagram so this is subjective at the least. This method does not produce changing lines within the natal hexagram which in consideration it actually should not. This is a static representation of your basic qualities. Those who practice the art of divination of the I Ching realize that each hexagram presents a set of conditions for the question being asked. If the person follows the recommendation of the commentary there will be no serious errors. But if he strays from these recommendations he will be open to suffer the consequences. What the hexagram represents is a general situation in which the free will action of the person determines whether this action will result in ‘good fortune’ or ‘misfortune’. This generality is also true in the astrological chart natal hexagram. The astrological chart natal hexagram is a generic representation of the nature of the person. It is not an in depth delineation. Consider for instance that there are twenty seven (27) different ways to form this hexagram from a Sun, Moon and Ascending sign. This same hexagram could be formed by a person who had a Sun in Pisces, Ascending sign in Cancer, and a Moon sign in Gemini. Also it could be formed by a person who had a Sun sign in Scorpio, Ascending sign in Pisces, and a Moon sign in Libra. By using the elemental signs to form the hexagram we need to remember that there are three Water Signs, three Fire signs, three Air signs and three Earth signs in every astrological chart. In this particular hexagram, the Sun sign is a Water element, the Moon sign an Air element and the Ascending sign is also a Water element. This hexagram could have been formed with a Sun sign in either Cancer, Scorpio, or Pisces. The Moon sign could have contained either Gemini, Libra, or Aquarius and the Ascending sign could have contained either Cancer, Scorpio, or Pisces. This results in 27 different ways this hexagram could have been formed by using two Water signs and one Air sign. When the I Ching is consulted, its response presents you with sixty-four different conditions, but in the case of the astrological chart natal hexagram, it defines sixty-four different generic types of human nature; each one formed from the astrological elemental signs and each one defined by one of the sixty-four hexagrams. This was a most helpful article thank you it is assisting me in my own research.